1. Cases are checked for water-resistancy then dismantled, cleaned and polished. 2. 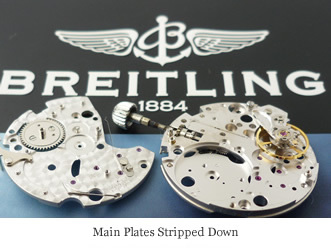 Movements are dismantled down to the main plate, moving parts are checked for wear. The whole movement is ultrasonically cleaned. On reconstruction, parts that are worn are replaced, new mainsprings fitted, fresh oil is applied and finally regulated to factory specification. 3. 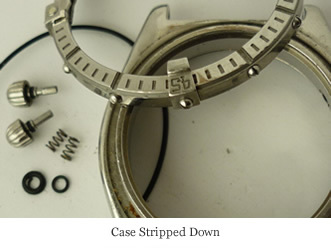 Reconstruction of case with new gaskets and water-test. 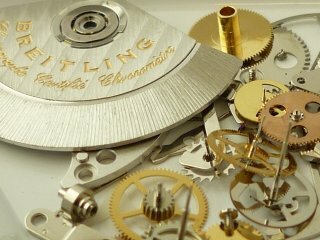 Fit serviced movement and before closing up the case, a further timekeeping test and regulation is carried out. 4. The cased up watch is put on an autotest. This checks if the self-winding mechanism is functioning correctly. After rotating for several days further checks and adjustments may be required. 5. 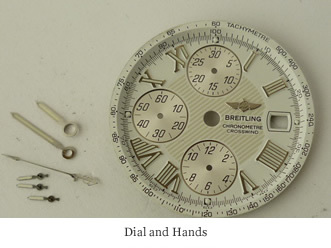 Once all tests have been completed the watch is made ready for collection by appointment or for despatch back to you.